Regardless of whether you want to switch over to well water or simply need a well replacement, it’s important to hire a reliable and experienced well contractor to complete your well drilling. At Well Doctor, our technicians are experienced and specifically trained to be able to help you through every step of the drilling process. In other words, our technicians will communicate and help you decide which well pump is the perfect option for you. We understand that everyone has different reasons why they want a well, along with different budgets. That’s why we offer a variety of well pumps that come with different price tags, depth requirements, and maintenance levels. So, you don’t have to worry about installing a well pump that might not satisfy your needs. Finding a reliable company for well pump repair near me can be difficult. After all, it’s overwhelming enough when you need to repair your well. That’s why you shouldn’t have to add the stress of wondering if your well contractor is experienced and punctual. At Well Doctor, our technicians have over 25 years of combined experience, which means our team is comprised of some of the best and most knowledgeable well technicians in Lake Norman! 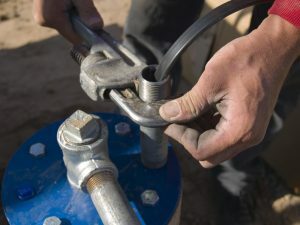 Our technicians are ready to tackle any type of well repair, which includes everything from minor fixes like casing to more worrisome repairs like a sudden water shortage. Regardless of the type, our technicians start the repair process by evaluating your well and creating a comprehensive plan of attack. Don’t worry about being left out in the dark about what’s going on with your well until you get your bill, because our technicians communicate with you every step of the way. This also means you don’t have to worry about any “extra” work being done or having to pay hidden fees. It’s important for every Huntersville well owner to know what’s in their well water. That’s why we offer free and paid well testing. Our free well testing service checks your well water for standard problems, such as a pH level imbalance, hardness, or iron. If you want a comprehensive well test, then our paid well test is the perfect option for you. Our paid well testing checks for everything from bacteria, such as coliform and e-coli to lead, nitrates, and nitrites. Don’t worry if your well water has an issue, such as a pH level imbalance or bacteria growth because we offer comprehensive well treatment. Our well treatments range from simple neutralization and softening to filtering and chlorination. Regardless of your well water problem, our technicians are trained and experienced enough to treat it. At Well Doctor, we understand the importance of having affordable and accessible well water service in Davidson. That’s why we offer 24/7 emergency well repair. If you notice something suddenly wrong with your well water, such as low pressure or no water at all, our technicians can help you at any hour of the day. For more information about our emergency well services, as well as any of the services mentioned above, contact us today at (704) 909-9258! We are a small, family owned and operated local business, and we pride ourselves on treating our customers like family. Ask about our teacher, veteran, and senior citizen discounts!